Fat Princess is almost terrific. It's a flawed gem that combines class-based multiplayer mayhem with a sprinkling of real-time strategy, wrapped in a charmingly animated cartoonish art style. The resulting mayhem of thirty-two players in a giant scrum of capture the flag is delicious. Oh, and the flags are princesses. That you feed cake to. To make them fat. Because fat flags are hard to capture. The first order of business is to grab a hat. Obviously, the hat you wear determines what class you are. There are five in total, and four of them fall neatly into MMO-ish roles. The Warrior excels at "tanking" the enemy and absorbing damage, the Ranger delivers long distance pain, the Wizard can handle "crowd control", and the Priest keeps them all alive. 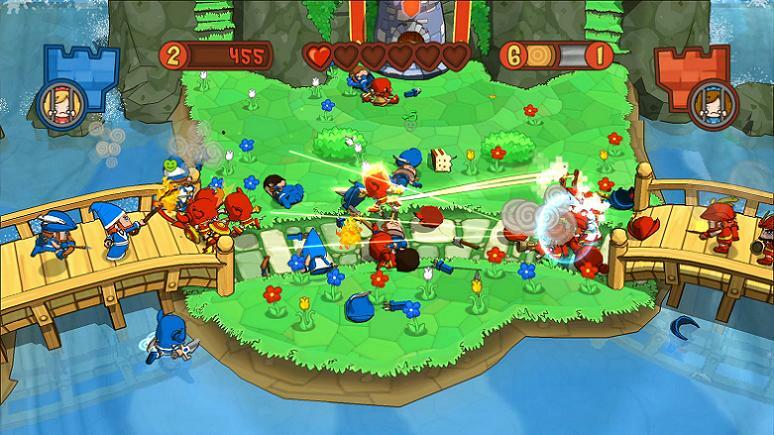 While Fat Princess might initially look like a maelstrom of chaos, proper teamwork cleanly crushes undisciplined solo mercenaries. The fifth class, while less glamorous, is the most indispensable. The Worker collects lumber and metal to build structures and upgrade the classes. The builds include everything from catapults, bridges, and siege ladders that provide tactical access, as well as repairing broken gates that impede enemy progress. The class upgrades are vital improvements: the Warrior gains a two-handed halberd for substantial damage output, the Ranger gets a brutalizing musket, the Wizard can expel freezing ice in addition to fire, and the Priest can go dark and drain life from foes. The upgraded Worker can throw devastating bombs. And at any time, players can switch between classes by picking up the appropriate hat, whether at the home base or from fallen combatants. These battles are conducted over eight largely terrific maps brimming with variety. They feature great visual themes, ranging from a volcano to pirate ships, and tons of features to interact with including outposts to capture, secret passageways, chicken potions, a soccer mode, and more. The resulting hullabaloo of frantic combat, paradoxical cutsey blood and gore, and the self-aware humor is genuinely charming. When Fat Princess' narrator exclaims, "They're in our base ganking our dudes!" in a reserved English accent, or the credits roll to Sir Mix-a-Lot's Baby Got Back, you just have to smile. Considering the price point of $15, Fat Princess is an ambitiously complex and entertaining product. The presentation and gameplay are both funny and polished. Unfortunately, the online issues are neither. When it works as intended, it's so good that it's worth putting up with the hassles. It's just a pity that you have to.